If you’ve noticed that your basement has excess moisture or water, you may need to have basement waterproofing performed. Sneezing, coughing, or other reactions consistent with allergies when in the basement. Mold is a health hazard. It is strongly advised you should not attempt to remove the mold yourself. You may not eliminate the entirety of the mold, or you might inadvertently spread mold spores. Furthermore, you didn’t deal with the source of the problem, the moisture in the atmosphere. Call Dr. Pipe Drain and Plumbing Services and we’ll provide a free and thorough inspection of your basement. We’ll then provide a plan as to how to correct the situation and prevent further damage. 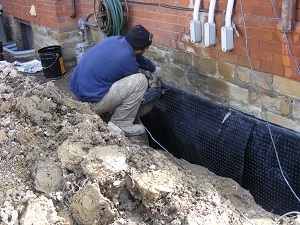 Our team has several waterproofing solutions for both interior to, and exterior of the house. adding a backwater valve that blocks water coming from the street to your home. install new or updated weeping tile. These are tiles that drain the water away from the house to a sump basin or elsewhere. How much Waterproofing in Ottawa Cost? The cost of waterproofing your house is dependent on the size of the area to be waterproofed. We’re happy to perform a no-cost inspection and talk with you about your needs and your options. From there, we can then determine what and how much your solution will be. If you’re worried about how much it will cost, Ottawa has the Residential Protective Plumbing Program and additional residential grants. Qualified residents may be eligible for financial assistance for preventative maintenance and repair to their plumbing systems. Certain conditions apply. The website gives full information related to the program, including grant values and rebate amounts for types of work done. Many companies offer licensed plumbers, but Dr. Pipe Drain and Plumbing Services also offers respect for your home and your time as our standard. This means from the time you call us, we are committed to making your entire experience as customer friendly as possible. We coordinate times that work with your schedule and call when we’re on our way. Our plumbers keep our areas neat and covered while working. In our projects, we use the most appropriate solutions to work quickly and efficiently. Our strengths do not only lie in plumbing. We can also help to navigate the insurance companies and city red tape. You will receive all the necessary permits for our jobs. We will guide you through the City of Ottawa rebates for which you qualify. Our customers love us, and our work is the best quality. Stop by our testimonials page, then give us a call to set up your free, no-obligation inspection.